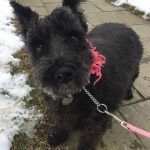 Sophia is about 7 years old and is a black mini schnauzer who loves to play with her toys. She can chase a ball for hours and loves playing frisbee. But she would also love to snuggle up after play time.